“A pessimist is one who makes difficulties of his opportunities and an optimist is one who makes opportunities of his difficulties.” Harry Truman. The excellent article ‘How continuity of care is experienced within the context of integrated palliative care: A qualitative study with patients and family caregivers in five European countries’ 1 brings to the reader some concepts about continuity of care and integrated services and much information about five specific countries as well. A deeper reading brings the possibility to reflect on other countries, in this case – Brazil. The concept of continuity of care and the three interrelated dimensions that comprise the concept expose the gaps and challenges of Brazil. It is possible to find difficulties in the three dimensions quoted in the article and some results are probably very similar to the daily routine of Brazilian healthcare professionals, people who need palliative care and their families. The fragmented fashion and the lack of informational continuity are situations that are common each day in Brazil. They are harmful to people who need palliative care, and their families, and merit further study in Brazil. The Brazilian healthcare system is based on decentralization to offer care in multiple places. Yet, despite primary care being the entry point to better health care, access, correct evaluations and follow-up of patients are limited because of the lack of electronic data collection. The article commented on the role of the general practitioner (GP) and other professionals. The role of GPs is very well defined and over the past few years journal articles have increasingly described the importance of their role in offering palliative care. However, even in palliative initiatives, such as those shown in the article, the GP has to assume this main role and this kind of attitude is necessary for all health professionals, whether or not they are part of a major palliative care initiative. In Brazil, the role of the GP in palliative care is now being discussed with more frequency and emphasis. Now, is the time to think in terms of a large-scale proposal within the Brazilian public health system, to learn from the programmes that are already running and to find ways of improving access to palliative care for the large number of the population who need it. Some examples could be quoted. Rio Grande, in the south of Brazil, is a good example of a public approach to palliative care. The project ‘Estar ao Seu Lado – Cuidados Paliativos na Atenção Primária’ and the secretary of ‘Coordination of Family Health Strategy and Municipal Health’ in Rio Grande are working together to expand the provision of palliative care to more people. The inclusion of palliative care in the Municipal Health’s Plan 2018-2021 to run an education programme and improve the skills of the other Family Health Strategy’s teams is a milestone and demonstrates their interest to provide access to palliative for all those who need it in this region. In the same way, the Palliative Care Work Group of the Brazilian Society of Family Medicine and Community is working hard to share this message with other colleagues, nationally and internationally. The challenges to fill the gaps and provide the best continuity of care in Brazil are now well recognised by the professionals but meanwhile, sadly, the deficiencies are experienced by the people who most need palliative care. However, the recent increasing discussion brings some hope and the possibility to see the future through a glass half full. den Herder-van der Eerden M, Hasselaar J,Payne S,Varey S, Schwabe S, Radbruch L, Van Beek K, Menten J, Busa C, Csikos A, Vissers K and Groot M. How continuity of care is experienced within the context of integrated palliative care: A qualitative study with patients and family caregivers in five European countries, Palliative Medicine, Volume: 31 (10): 946-955. First published online: March 1, 2017. Download a copy here. Projeto ‘Estar ao Seu Lado – Cuidados Paliativos na Atenção Primária’ Facebook page. Contact Santiago Correa by email. 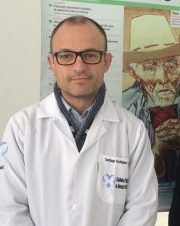 Read earlier posts by Santiago Corrêa on the EAPC Blog. European Association for Palliative Care Reference Group on Primary Care. This entry was posted in NATIONAL & INTERNATIONAL REPORTS and tagged Estar ao Seu Lado – Cuidados Paliativos na Atenção Primária, Integrated care in palliative care, Primary care in palliative care. Bookmark the permalink.